Monster Hunter 4 will challenge players to use various terrains to their advantage. The newest issue of Famitsu went in-depth with the Monster Hunter 4 developers to ask them what the newest installment will add to the series overall: the 3D gameplay. The Nintendo 3DS game, set to come out in Japan on Sept. 14, will take full advantage of 3D landscapes to provide new challenges to players. Designer Yuya Tokuda said, "For the development team, we felt we'd be hitting the wall if all we did was give you more monsters. So instead we're trying to give you more action, and I think that's a good thing." 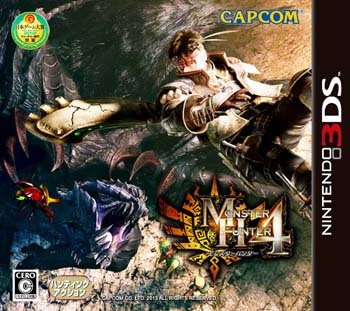 Midair fighting is possibly the biggest addition to the gameplay in Monster Hunter 4. Moreover, the game will encourage the player to interact with different tiers of terrain, meaning hunters will climb walls or look down from valleys. Jumping down from higher points allows the player to take advantage of attacks from above and the ability to grapple onto monsters. Director Kaname Fujioka said, "The most important thing is that the controls feel good for the player, so with that in consideration, we're reworking the behavior of the hunters and the monsters... I think instinctual desires, like wanting to climb up walls or execute jumping attacks, are also important to pay attention to." The addition of mid-air attacks required producer Ryozo Tsujimoto to consider what kind of effects these attacks would have on the gameplay. "We thought about boosting the amount of damage jump attacks give you, but the concept of damage isn't something you can easily see here, so it's hard to see what payoff it could have." As a result, Tsujimoto says they added the ability to latch onto monsters, but be careful because monsters also have latch-on attacks. There is still no word whether the game will come to North America or Europe.